To get your driver’s licence in NSW, you need to go through four main stages: getting your learner licence > getting your provisional 1 licence > getting your provisional 2 licence > getting your full licence. Finding a good driving instructor in New South Wales is a very important part of getting your driver license.Why bother wasting time shopping around when driving instructors can come to you. Register and publish your request via this page. Also you can compare driving lesson prices from Sydney driving schools. What test/s do I have to take? I’ve completed the requirements, now how do I get my learner licence? Your learner licence will be issued to you on the spot when you successfully complete the required tests and pay the licence fee. What does having a learner licence mean? b.Must have completed at least 120 hours of driving practice (including 20 hours of night driving). These hours must be recorded in your Learner Driver Log Book, which was given to you when you received your learner licence. I’ve completed the requirements, now how do I get my P1 licence? Your P1 licence will be issued to you on the spot when you successfully complete the required tests and pay the licence fee. What does having a P1 licence mean? What’s on the The Hazard Perception test? I’ve completed the requirements, now how do I get my P2 licence? 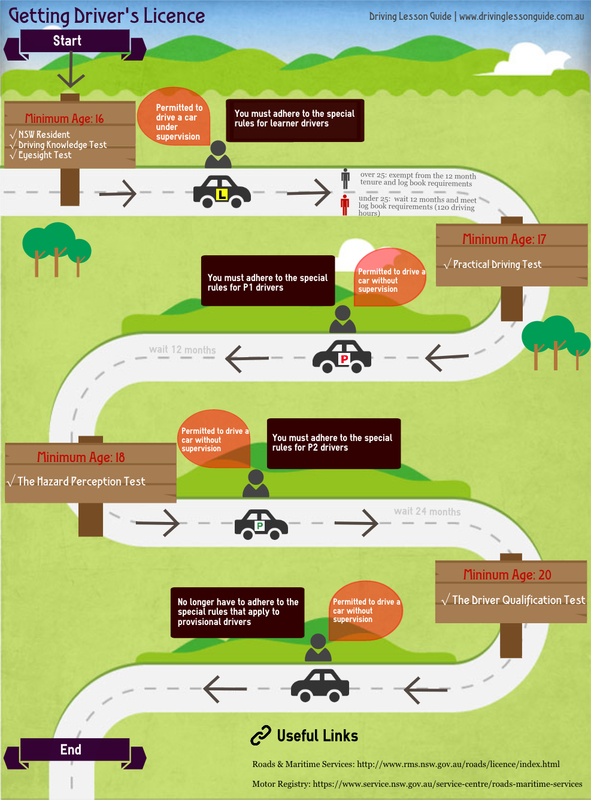 What does having a P2 licence mean? The Driver Qualification Test combines knowledge questions (road rules and safety) with a more advanced version of the Hazard Perception Test that you completed to get your P2 licence. The Driver Qualification Handbook, available online or at any motor registry. I’ve completed the requirements, now how do I get my full licence? What does having a full licence mean?